In this work, a core–shell molecularly imprinted polymer (MIP) was synthesized through sol–gel coating procedure by using silica beads, emodin, 3-aminopropyltriethoxysilane, tetraethoxysilane and tetrahydrofuran as supporting matrix, template, functional monomer, cross-linker and solvent, respectively. 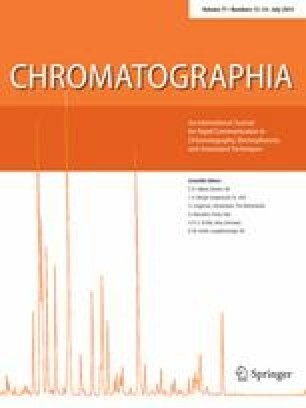 The selective recognition property for emodin and its analogues (physcion and aloe emodin) of the resultant MIP was evaluated in a chromatographic column for high-performance liquid chromatography (HPLC). The retention time and imprinted factor of MIP column for emodin, physcion and aloe emodin were 5.11, 0.63, 0.69 min and 4.69, 0.75, 1.38, respectively. It showed that the MIP beads had a good binding ability for emodin. Finally, one-step separation of emodin from alcohol extract of Rheum palmatum L. at semi-preparative scale was achieved and 380 mg of emodin was collected in 5 days. The product was characterized by mass spectrometry and HPLC and its purity was 95 %. Liquid chromatography Molecularly imprinted polymer Semi-preparative separation Emodin Rheum palmatum L.
T. Chen and J. Gu made equal contributions to this work. This work was financially supported by National Key Special Project of Science and Technology for Innovation Drugs (Grant Nos. 2008ZX09401-006, 2009ZX09502-015 and 2012ZX09501001-004) and the country support National science and technology project (2008BAI51BOO).